JAKARTA (5 Nov 2018) – After failing twice to land ASEAN’s biggest prize – the AFF Suzuki Cup – as a player, Bima Sakti will be aiming to win it as a the head coach of the Indonesian national team. 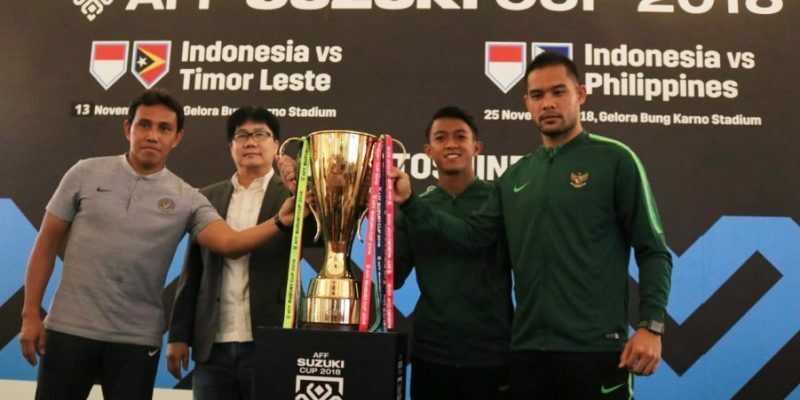 Speaking after the AFF Suzuki Cup 2018 Trophy Tour in Jakarta that was attended Andritany Ardhiyasa and also Febri Hariyadi, Bima said that it is important that the delivers the trophy considering that Indonesia were the losing finalists for five times. “As a player – during the Tiger Cup days – I managed to make the semi-finals and also the final. But I could not lift the trophy. I hope that this time round I will be able to do it as a coach,” said Bima. In the meantime, Febri added that it will be a tough outing for Indonesia especially when they are against defending champions and five time winners Thailand in the group. And not only that, Indonesia will also have to contend with four-time winners Singapore, the Philippines and Timor Leste in Group B. “All teams in the group are difficult,” said Febri. Indonesia’s first game will be against Singapore at the National Stadium on 9 November.